WELCOME TO FLC REWARD ENGLISH CLUB! The English Club is another unique opportunity to overcome the language barrier and considerably improve your English language skills through participation in a variety of interesting and informative forms of communication. 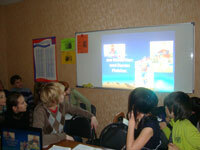 The English Club is conducted every Sunday from 11.30 till 13.00 in the central office of FLC Reward (Gagarin St., 16). Every meeting of the club is devoted to a different, current and stimulating topic chosen to foster an atmosphere of enthusiastic and intense discussion and exchange of opinions. For instance: “Theatre or cinema: Which do you prefer?”, “Is there any connection between success and good luck?”, “An ideal husband – an ideal wife”, “The Internet – good or evil?” and many, many others. "The work" of the English Club is based on the usage of special learning aids, containing the most frequently used basic vocabulary, popular idioms, thoughts of outstanding people as well as different activities designed to stimulate discussion in English. Watching a video episode devoted to the topic of the class and taken from a modern British or American film is a mandatory component. Before watching the episode new vocabulary is studied and after watching, an active discussion takes place. The method of conducting the meeting of the club is somewhat unique. It makes the participation of any "member" possible and interesting, even if a "member" doesn’t possess a particularly high level of knowledge of English. Live communication in English with guests from the USA, Canada, Great Britain and other English-speaking countries enables you to not only improve your English, but to get a lot of useful and interesting linguistic and cross-cultural information. The particularly warm, friendly and creative atmosphere of the English Club will make you feel comfortable enough to participate fully and offer your own opinions and ideas. At our meetings even the most taciturn and silent member will become more confident and fluent. The Specially Organized English Club for schoolchildren offers an opportunity to have live communication with American and English professional teachers, using the unique learning aids which include topics of special interest for schoolchildren. Schoolchildren will not only improve their listening skills and become more fluent, but get a lot of new interesting “first hand” information! In addition to the vocabulary, numerous tasks, and the video episode the Club for schoolchildren includes Power Point presentations devoted to a particular topic and given by native speakers of English. Regular attendance of our Club is another step in the right direction towards fluent English!